What are the hip flexor muscles? The hip flexor muscles are responsible for raising the thigh toward the trunk – i.e. hip flexion. They are active in stepping forward when walking or climbing stairs. They are also important in the kicking motion. 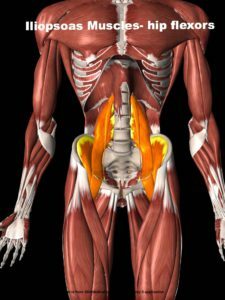 This muscle group includes the Psoas Major, Psoas Minor and Iliacus muscles. They are often referred to as the Iliopsoas muscles and are generally located in the front of the lower spine, pelvis and hip. Other muscles of the thigh also assist in hip flexion. Why stretch the hip flexors? Tight hip flexors will limit hip extension, which means a normal walking gait is hindered. 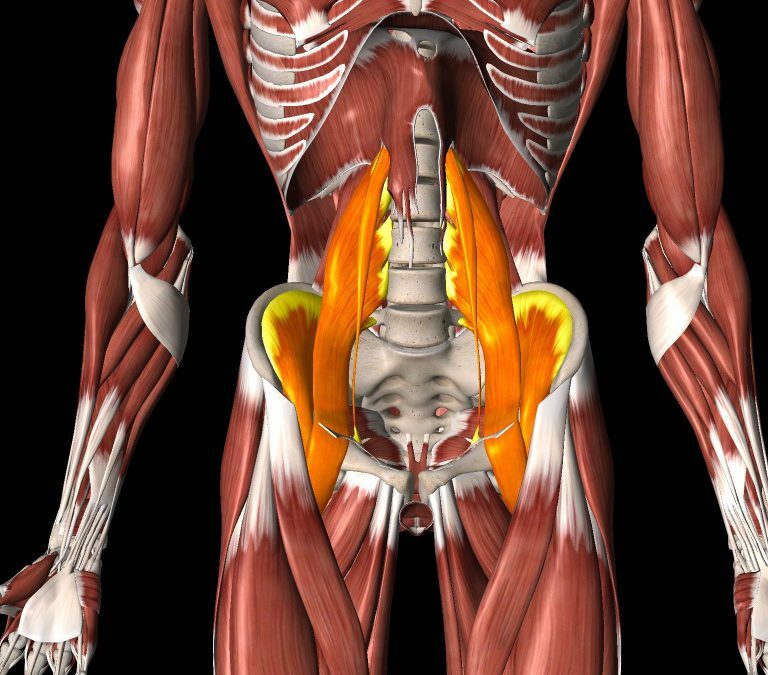 When they are tight the hip flexors will tilt the pelvis forward and place excessive stress on the spine. A forward tilting pelvis gives you an excessive arch in your low back. This excessive arching and added compression on the spine are significant contributors to poor spinal mechanics and back pain. The hip flexors are shortened when we sit. Hence, prolonged sitting causes tight hip flexors. 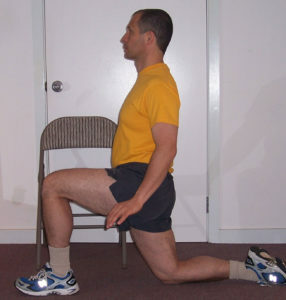 Get down on your right knee -preferably between two chairs or at least next to one chair or table. Stretch the right leg back and point your toes. Keep your left foot flat on the floor, in front of you and the left knee directly over the mid foot – i.e. the shin should remain vertical. Move forward with your trunk, keeping ears, shoulders and hip joints in a vertical alignment. This means you keep an erect posture from the hips up (see picture). Move forward until you feel a gentle stretch in your front thigh and/or hip. Hold stretch for 30 seconds. Repeat twice for each side. You may use two chairs to better support yourself on both sides. In this picture the chair on the left is removed so you can see the proper body position. You may also place a pillow under the shin on the floor to avoid pressure on the knee. If you have very tight hip flexors, or the half kneeling stretch is uncomfortable for your knee or back, try the following alternative. Lie on your back on a firm bed or table. Your knees should be over the end of the bed so your foot and lower leg hang freely. Bring both knees toward your chest. Let the left leg come down slowly as you hold your right leg toward your chest (this helps keep your back flat on the table or bed). Allow gravity to pull your left leg so it hangs freely. You must keep your back flat (with the help of your right thigh being held close to the chest). For both these stretches the feeling of comfortable stretch should be felt anywhere in the area from the front of the thigh to the front of the hip. Suggestions made in this publication are no substitute for medical advice. If you have any pain or difficulty performing the described stretches, seek advice from your appropriate health professional. Domenic Lopez B.Sc., Certified Clinical Exercise Physiologist and Licensed Massage Therapist, is owner and operator of Healthy Moves, a private practice where massage therapy and movement education help you achieve better living.